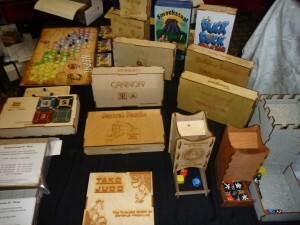 The GAMA Trade Show 2010 (GTS) is over and here is the first in a long series of reports from the event. I plan on covering about 10 exhibitors per post, per day, so check back every day over the next week for updates. 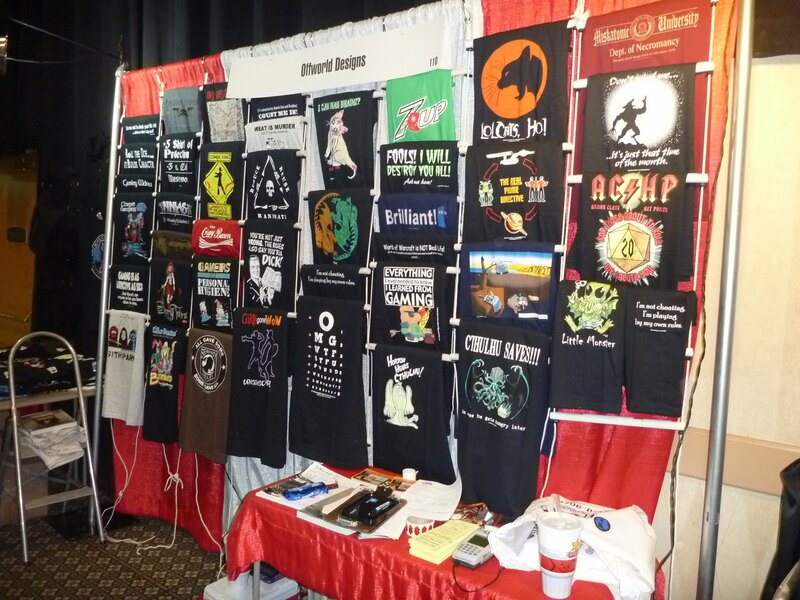 Each entry will include an image of the booth and a description of what the vendor is doing/planning for this year. At the end, I will put together a “round-up” post will all the relevant links. I highly suggest you subscribe to the Livingdice.com RSS feed so you do not miss any posts. If you have any questions about a vendor, drop me an email and I will do my best to answer. 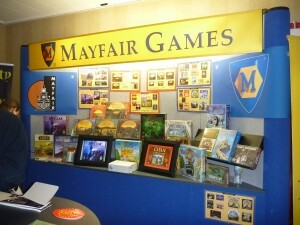 Mayfair also announced that Ray Weirs of Tsuro fame will be working with them. Offworld Designs sells unusual t-shirts at game conventions. They had an extensive booth with many geek-related offerings. They also gave away the best business card at the entire show, printed on the back of a t-shirt! I was especially fond of the “Meat is Murder. Eat the Evidence” shirt. Offworld also does custom work with a minimum order of 30. 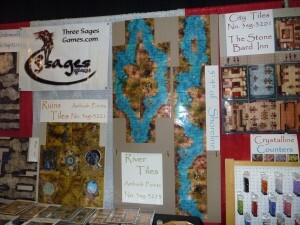 Three Sages Games extended their line of flexible plastic tiles for tabletop RPGs. The tiles are dry/wet erase compatible and come in several versions for urban and natural environments. The “Perils of Ophelia” is a 4E compatible module series from 3SG. Interestingly, the modules included tiered encounters for the level range of the module and the number of party members, laid out in a clean chart. It makes determining the correct encounter very easy. One of the plastic tiles from their tile line also comes with the module for the final encounter. 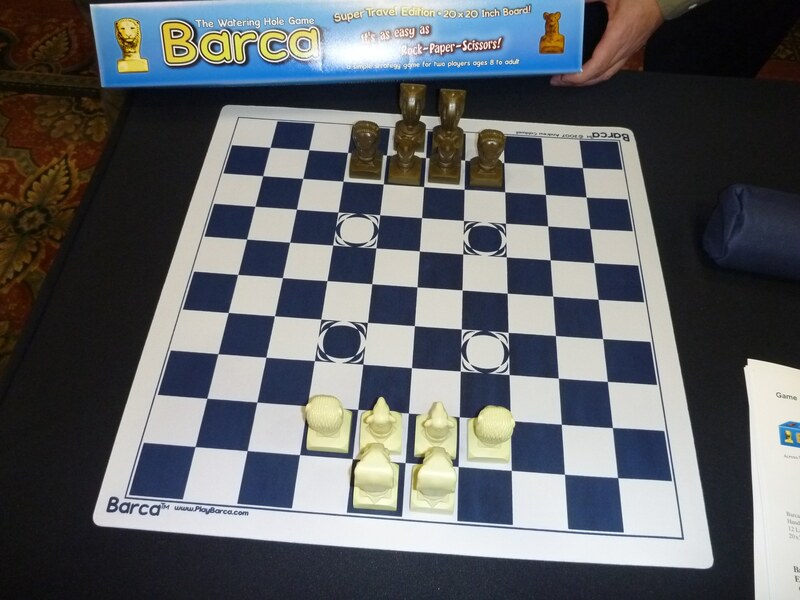 Caldwell Gameworks had an interesting chess variant called Barca. The pieces move around similar to chess, but some pieces “fear” others and cannot stay next to them, forcing movement. Play time was only an hour. Here is a shot of the board. I also took some video of the demo. 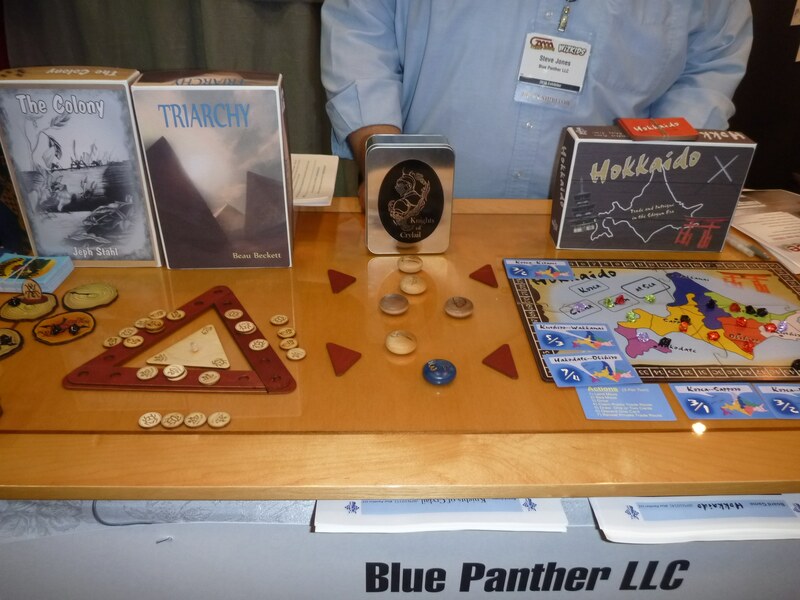 Blue Panther games all use wood as their base component, cut with a laser. 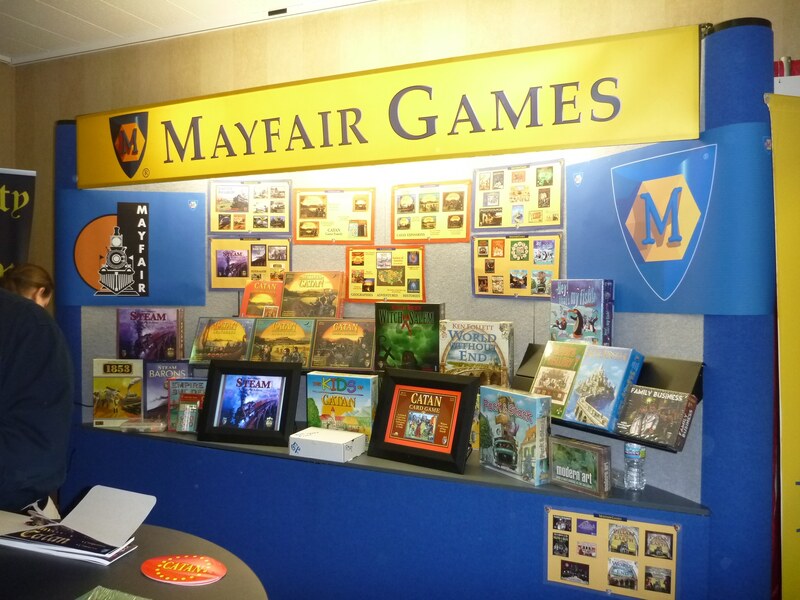 They had a couple of new games, “Triarch” and “The Colony” on display. Triarch is pictured below. They are abstract strategy games. “Hokkaido” is a path building game that reminded me a bit of Catan. All these games release between April-July of this year. The “Card Tower” was a collapsible dice rolling tower that also holds a standard deck of cards. Blue Panther also sells components for the “Piecepack” game system. Piecepack uses the same components to create different games. There are over 150 rule sets so far! Interesting idea and very cost-effective. 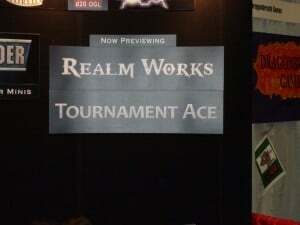 Lone Wolf, creators of “Army Builder” and “Herolab” announced two new products: “Realmworks” and “Tournament Ace.” They had a demo up of both, but they are still in very early versions. “Realmworks” is a campaign management system that allows a DM to track the party’s progress through his plot. It is not a wiki, since the players do not have access to certain areas and knowledge. Currently this is local PC only, but there is a ‘publish to web” option under development. “Tournament Ace” is for game retailers and clubs to run large tournaments. It handles matching players, handicapping, players leaving early, swiss-style and round-robin tournaments, among others. It also tracks performance, so frequent players can be “seeded” against appropriate opponents. Still in early development stages, but I think retailers will be thrilled to have something like this for large events. No firm release dates on either software package. Mindgene, producers of the “d20Pro” online RPG tabletop have a new version releasing soon with many new features, fixes and better support for 4E. I will get a separate post up on this after I am through all of the GTS material. Dragon Breath had “Junk Mail” and “Honk” on display. “Junk Mail” is a non-collectible card game with Magic-like mechanics and a spam email theme. “Honk” is a card-based racing game. 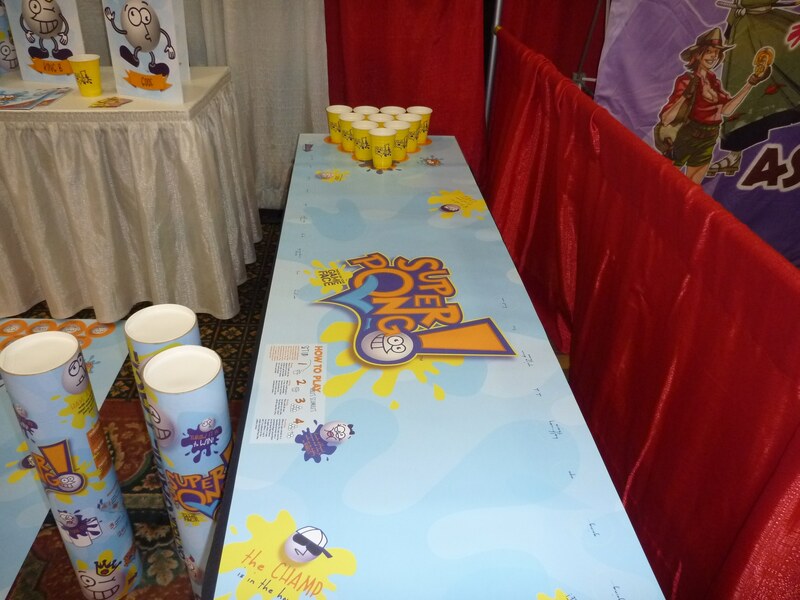 Superpong is a kid-friendly version of “beer pong,” complete with themed ping-pong balls. Although they pitched this one for kids, I have a feeling it will sell well near college campuses as well. The playing surface was a 6-foot vinyl roll. This game is currently still a prototype. 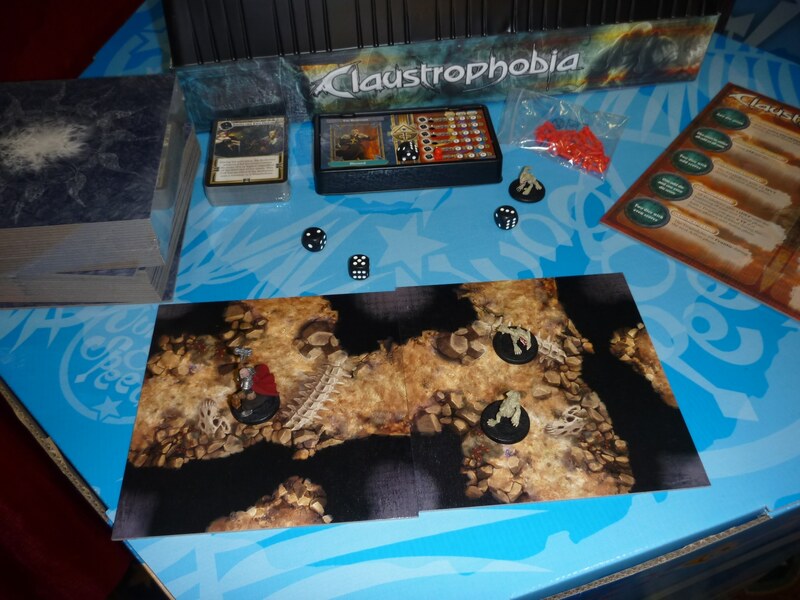 Asmodee ran a quick demo of the “Claustrophobia” board game. It reminded me of the old PC game “Dungeon Keeper,” where one player runs the villains and another a group of heroes. Might like to get a closer look at this one. Also on offer was an “Apples to Apples-like” card game called “Dixit.” It uses picture cards and an interesting “everybody agrees” type mechanic to play similarly themed cards. Best description I can give it. Very much a party game. 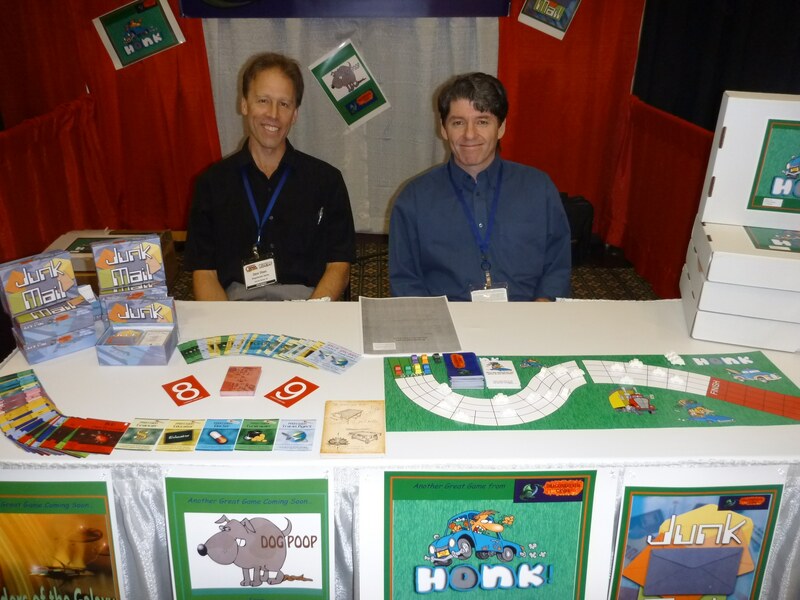 Fred had some new games on display, including “Cornucopia” which uses a “complete sets of cards” to achieve victory. A second printing of the wild-west themed “Carson City” releases April 1, 2010. 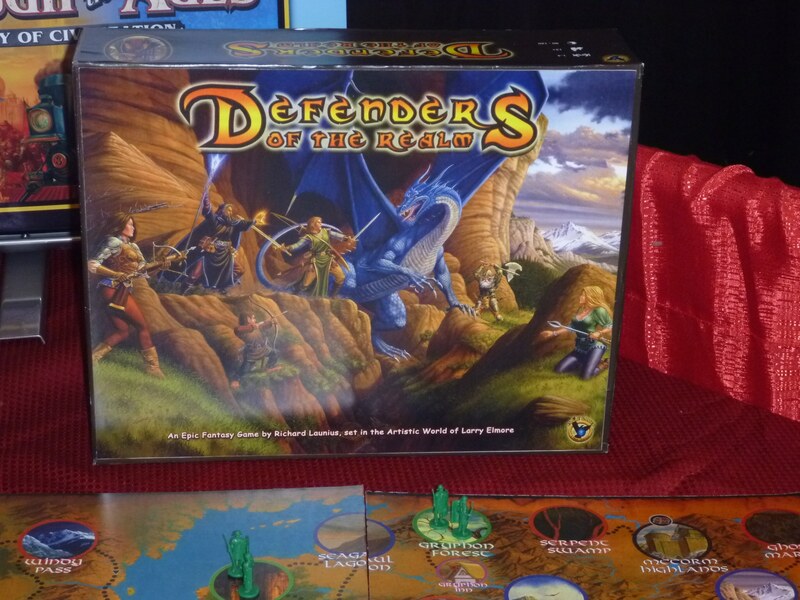 The main item for this year was “Defenders of the Realm.” Defenders is a cooperative fantasy board game that pits heroes against an invading horde of evil creatures. Larry Elmore of “Dungeons and Dragons” fame did the art for the game, so it very much looks like an old Dragon magazine cover. Quite pretty actually. I did not get a release date on this game, but I am very interested myself and will let you know when there is a firm release date. The images below are the prototype, so the actual game may look a bit different. If you find this series of posts on the GAMA Trade Show 2010 useful, please consider supporting Livingdice.com when you shop at Amazon. Just click on the banner below and a percentage of every purchase goes towards making Livingdice.com the best gaming site on the internet! 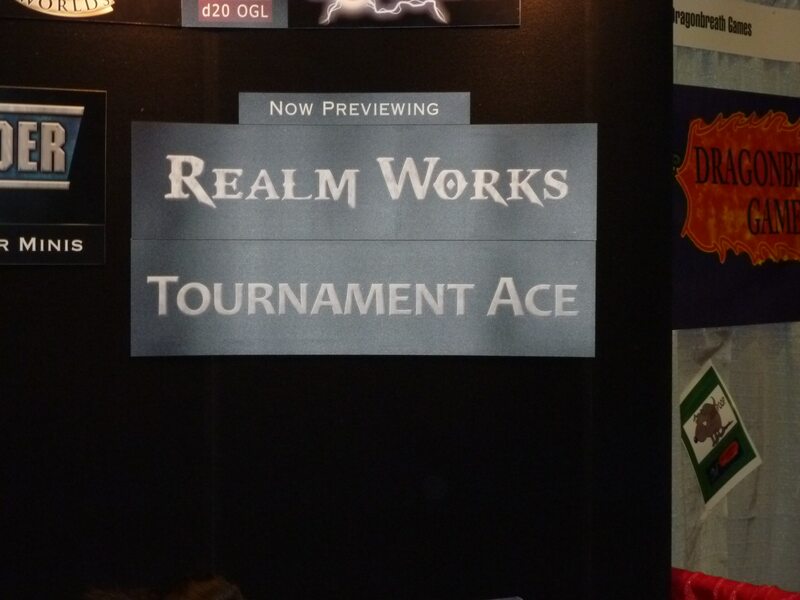 Would really love to hear more about RealmWorks from Lone Wolf. I’ve played Barca, and Drew is a pretty awesome guy. I would have loved to see a more thorough evaluation of his game. What I think is nice about this game is that it was something that my youngest child could play when my wife and I take our kids to the gaming conventions. 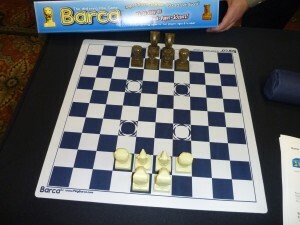 Barca holds up as a casual game as well as a strategic game. With a minimalist approach to game design and pieces, this game is easy to grasp and difficult to master. I like that it teaches some fundamental chess techniques while also maintaining a different perspective on that style of play. It’s child-like charisma makes it very family friendly. I bought for about $20.00 and it is a game we play often at the house. 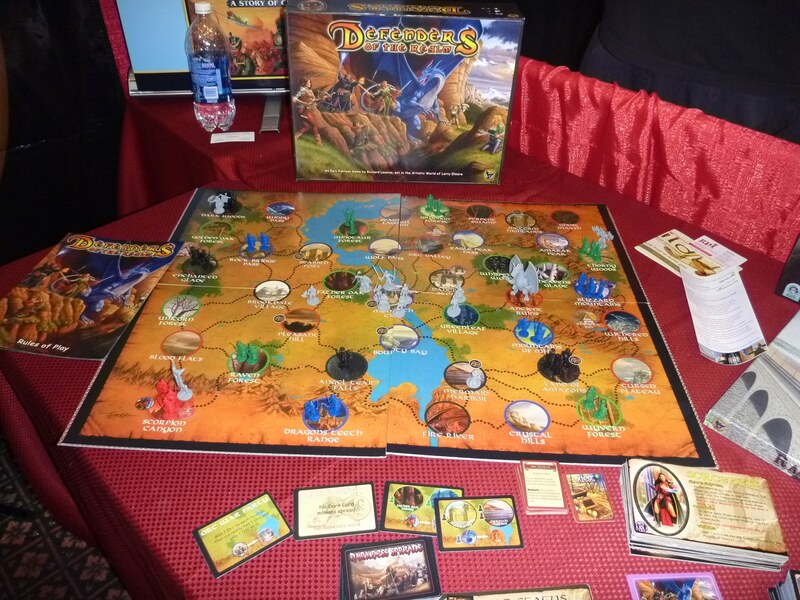 April 30, 2008 trask Comments Off on Gaming Spotlight: Living Forgotten Realms at Origins! 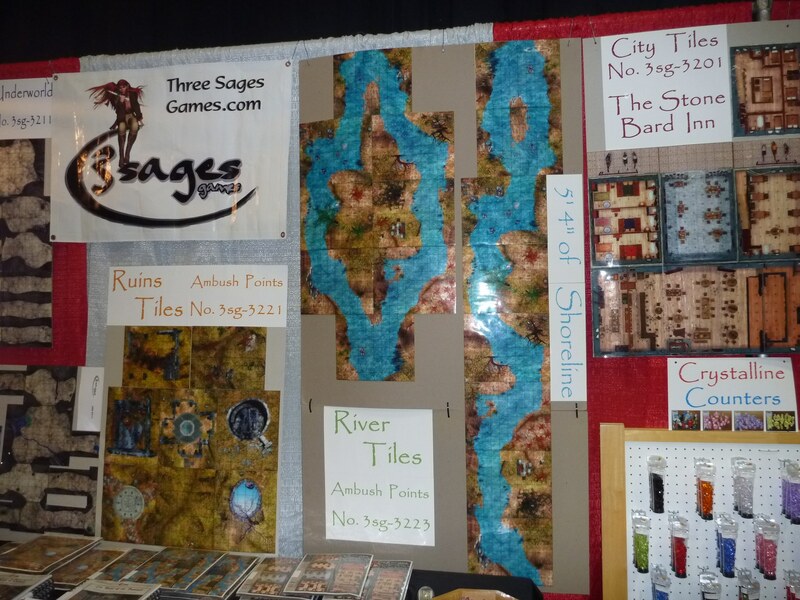 Gen Con 2013 Badge Sales are Live! Get One or No Hotel for You! January 27, 2013 trask Comments Off on Gen Con 2013 Badge Sales are Live! Get One or No Hotel for You!